Abstract: Standing 155mm tall, the Thermax Eclipse II heatsink weighs 822 grams and ships with two 120mm fans. Only one fan needs to be installed (default configuration), but if you think two fans are better than one be prepared for a moderately loud outcome. Both 120mm fans are non-PWM, so they rotate at a fixed 2200RPM all the time. Spire's Thermax Eclipse II heatsink is essentially identical to the elusive 3Rsystem Iceage 120 Boss II heatsink Frostytech previously tested. That cooler was a great thermal solution but never became available for sale anywhere in North America. It still isn't. Well, today is your lucky day. If you've been holding out for the Iceage 120 Boss II you'll be pleased to know that Spire's Thermax Eclipse II heatsink is just as good a performance cooler. It also suffers from the exact same problems as the original Iceage 120 Boss II; namely poorly thought out rubber fan mounts. Both the Spire and 3Rsystem heatsinks are constructed around five 8mm diameter copper heatpipes, have exposed heatpipes at the base and a distinctive "X" pattern that positions heatpipes in the path of higher velocity air. 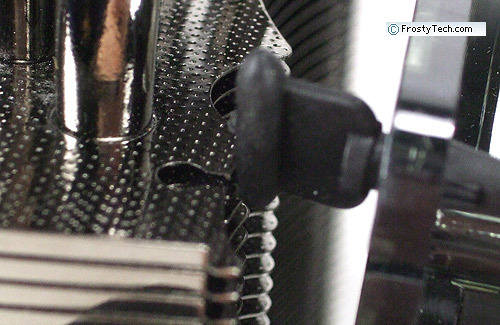 The Thermax Eclipse II heatsink has been dark nickel plated from head to toe, but still utilizes the same shape cooling fins, the same dotted texture on the surface of the fins, the same mounting hardware. Standing 155mm tall, the Thermax Eclipse II heatsink weighs 822 grams and ships with two 120mm fans. Only one fan needs to be installed (default configuration), but if you think two fans are better than one be prepared for a moderately loud outcome. Both 120mm fans are non-PWM, so they rotate at a fixed 2200RPM all the time. Spire's Thermax Eclipse II CPU cooler installs onto Intel socket 775/1156/1366 and AMD socket 754/939/940/AM2/AM3 processors, it retails for about $55USD from the usual list of Heatsink Stores. Materials: Dark nickel plated aluminum fins, copper heatpipes, aluminum base with exposed heatpipes. 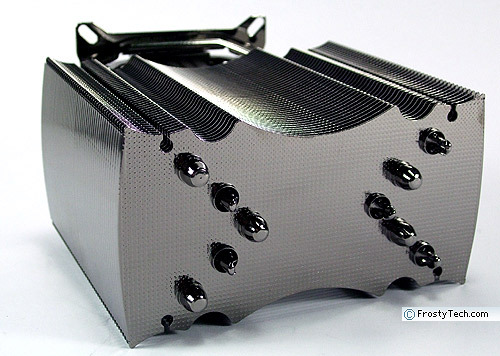 The fin pattern on the Spire Thermax Eclipse II heatsink reminds us a bit of the Batman symbol... The texture impressed on both sides of each fin is intended to disrupt boundary layer laminar airflow - basically causing turbulent airflow than can enhance heat transfer. Exposed heatpipe heatsinks are great for larger CPUs like the Intel Core i7 and those from AMD in particular. 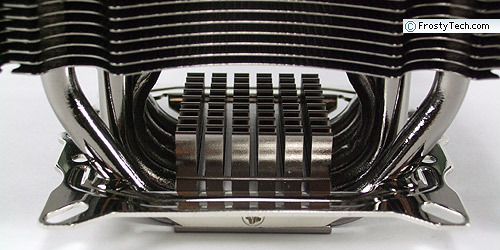 The five 8mm diameter copper heatpipes are stacked side-by-side at the bottom of the Thermax Eclipse II heatsink, with a small 3mm wide strip between each. As you can see by the difference in copper colour in the photo below, while the base is flat the five heatpipes are all flattened to slightly different levels. The fan holes are 105mm apart while the aluminum fin tower is 105mm high, so half the rubber post is left hanging in the air. What ends up happening is the rubber keys fall out, usually the bottom two. The bottom ones are also devilishly difficult to thread into position! Spire's Thermax Eclipse II heatsink ships with brackets for Intel LGA775/1156/1366 and AMD 754/939/940/AM2/AM3 processors. 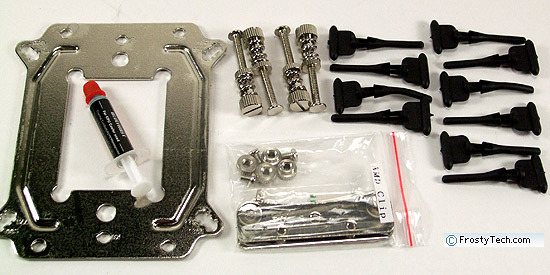 The heatsink mounts to both Intel and AMD motherboards using a permanently attached metal bracket. For certain AM2 motherboards, additional metal tabs are screwed into place to facilitate easy mounting on AMD motherboards. A collection of screws and spring-tensioned nuts accommodate the variety of hole patterns for the range of processors the Thermax Eclipse II heatsink is compatible with. 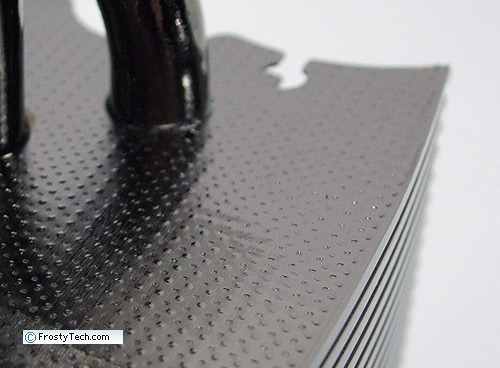 Eight rubber vibration absorbing fan posts are supplied along with the two 120mm non-PWM fans. 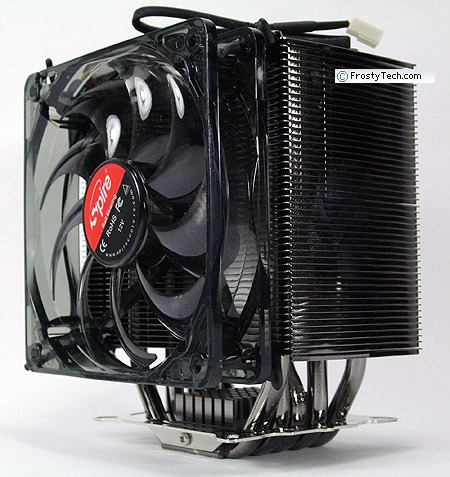 List all Spire heat sinks that Frostytech tested?